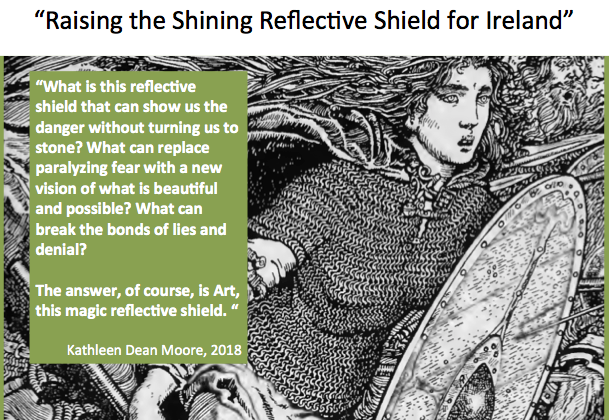 Update: I have been invited by Dr Nessa Cronin, NUIG to present this material again, on art and sustainability policy for Ireland, in Galway, in May 2019. Please contact me, if you are interested in attending. A study I undertook last year, Creative Carlow Futures (Fitzgerald, 2017; download here) which began as a review of international art and sustainability for County Carlow, quickly grew to scope policy for all of Ireland. The report argues the under-acknowledged, but potential central role of the Irish art sector to engage civil society toward more sustainable futures. I have been fortunate in having received some very welcome support from artists and residents in Carlow and beyond. But to tell you the truth, I wasn’t sure where the report might lead. However, perhaps the shocking winter that Ireland has just experienced has focused minds. I submitted an abstract of the report recently for the 50th Conference of Irish Geographer’s because this year’s theme is ‘The Earth as Our Home’. To my surprise, I had an enthusiastic response and invitation to present my findings on 10 May, 2018 at Maynooth University. Building on cognitive research and environmental philosophy, recent international cultural policy research, and as underlined by the United Nation’s publication of its 17 Sustainable Development Goals (SDGs) for people and the planet, there is growing evidence that the arts have a key role alongside science to engage a wider public toward more sustainable living and overall well-being. Unprecedented and accelerating climate and other eco-social challenges, if examined through moral reasoning, require urgent action from all sectors, and in particular, the art sector. This presentation explores these ideas to begin a conversation about starting a new public art for sustainability policy in Ireland. A recent art and sustainability study report for County Carlow and Ireland by Cathy Fitzgerald (Fitzgerald, 2017) highlights comprehensive cultural research, policy and strategies that are being implemented in Britain to foster the cultural sector to engage with issues of sustainability. This presentation reviews the report, which includes a discussion of the reasons why we in the cultural sector must act urgently, and demonstrates the diverse ways creative practitioners can engage with complex scientific issues. The study highlighted strategies from developed national art and sustainability programmes in England and Scotland, which include: assisting national and local cultural institutes to adopt energy audits so they become public champions of sustainability-learning for their visitors and audiences, and which also reduce running costs and make carbon savings ; curating events to educate cultural practitioners in sustainability science; and developing strategies that enable closer partnership between art and science and improved ecoliteracy for the sector. Please feel free to contact me if you are interested in this work. Comments are very welcome. A workshop at the conference will aim to progress a conversation about how cultural policy for sustainability might proceed. If you are interested and registered for the conference, the follow up workshop will be on Fri 11 May 2018, RM SE129 from 9-10.30 am, Maynooth University, Ireland. Congratulations Cathy, that’s really positive. Thanks Annabel, getting more interest in this, at last!